The Kalka Shimla Railway is a living example of Engineering enterprises of 19 th century. It was built to connect the then summer-capital of the colonial empire in India in the Himalayas with the Shivalik foothills at Kalka. Multi-arched galleries, like ancient roman aqueduct being the commonest mean of carrying the lines over the ravines between the hills. More than 900 sharp curves and 869 bridges, upto 4-storey multi-arch galleries, penetrating and climbing up the Himalaya mountain through 96.60 Km steep track is the greatest narrow-gauge engineering. A few of the bridges are unique, specially Bridge No. 226 (Sonwara - Dharampur section), Bridge No. 493 and 541 (Kandaghat - Kanoh section) have made their place in most of the photographs of celebrated magazines. Bridge No. 541, popularly known as Kanoh Bridge, is a unique example of 'Excellence in Civil Engineering'. This 52.90 m long, 23 m high with 34 arches in 4 tiers, having width ranging from 3.3m to 61.m is the most spectacular and still the highest arch-gallery bridge of Indian Railway. Similarly, Bridge No. 226 (Between Sonwara - Dharampur section) is the finest example of human endeavor in Civil Engineering. This is the longest arch-gallery bridge of Kalka-Shimla Railway with a length of 97.4 m, height 19.3 m, having 4-tiers with 32 arches of width ranging from 2.80 m to 4.30 m. This bridge is built on an arch too and is a true example of greatest narrow-gauge Engineering. This arch gallery bridge is an unique example of excellent mix of civil engineering techniques and use of economical local construction material i.e. stones and lime mortar for building a sturdy and solid abutment. It is situated at about 64 km from Kalka near Kanoh railway station. It is still the highest arch gallery bridge on Indian Railway. It is 52.90 meters long, 23.00 meters high and has 34 arches. Its special features include 4 storeys (tiers) of arch galleries, each with different configuration of arches, track on a steep gradient with a 48℃ reverse curve and withstanding the moving landmass of Himalayas over more than 100 years. The narrow-gauge track (2' 6" gauge) rises steeply from 656m height above sea level at Kalka to Shimla at 2075m. It is a remarkable feat of ingenious construction with 103 tunnels (102 existing) built in the 19 th century in just 4 years, including many shapes and designs. Some of the tunnels are engineering feat of highest level of skill. Tunnel at Barog (Tunnel No. 33, 3752 ft. long) is the longest tunnel of Kalka Shimla Railway section. When built, it was the 2 nd longest tunnel of Indian railway. Its construction started in July 1900 and got completed in September 1903. Construction posed numerous Engineering challenges, being passing through fissured sandstone rocks. Longest tunnel of this section is the sole witness to the most saddened story of this section. Epic related to the tunnel reveals that Engineer Barog, responsible for the construction of this tunnel was fined Re.1 by the authorities as he failed to connect both ends of the tunnel while burrowing. He committed suicide as he failed to digest his failure. The Barog railway station is named after him. The old tunnel and grave of this Engineer are still there, just a Kilometer away from the existing tunnel. The tunnel was finally constructed under Chief Engineer Mr. H.S. Herington at a cost of 0.84 million rupees. Similarly, Koti Tunnel (No.10, 2276 ft. long) and Tara Devi Tunnel (No. 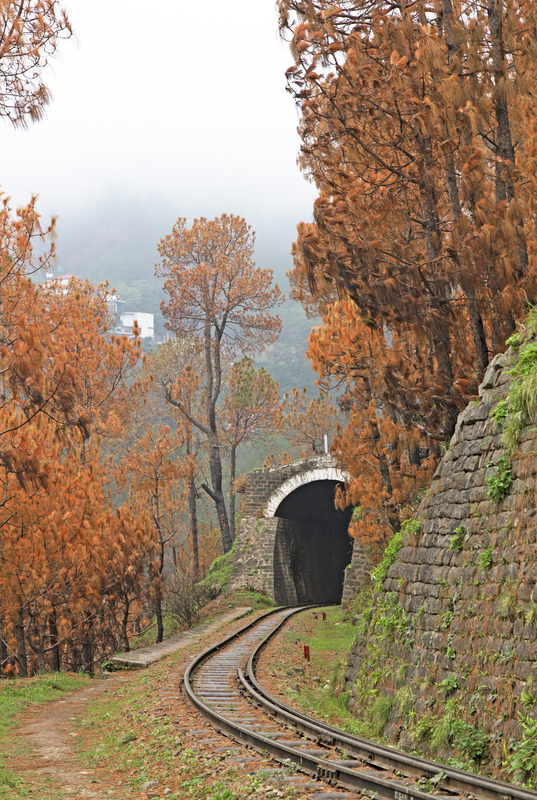 91, 1615 ft. long) are the second and third longest tunnels of Kalka Shimla Railway respectively. Tunnel at Barog (at a distance of about 42 km from Kalka) is 1.14 km long and is the longest tunnel on KSR section. When built, it was the 2nd longest tunnel on Indian Railways and is still among the longest tunnels in India. It's construction started in July 1900 and got completed in September 1903. It is a straight tunnel and is also the longest straight stretch on KSR. It's construction posed numerous engineering challenges being passing through fissured sand stone rocks. Originally, a two-kilometer long tunnel was planned under the charge of Mr. Barog. Tunneling was started from both ends but due to misalignment this had to be abandoned. The government fined him ₹1/- and this failure made him so ashamed that he shot himself. The Barog station is named after him. The old tunnel and the grave of this great engineer are still there, just a kilometer away from the present tunnel. This tunnel was finally constructed under Chief Engineer H.S. Herilngton at a cost of ₹ 0.84 million.